We manufacture a qualitative range of Paper Reel to Sheet Cutting Machines for our esteemed clients. These machines are designed for high production capacity and to straightly cut sheets or two ply corrugated board without damaging flutes and liner paper. Our quality personnel stringently check this machine on the set parameters to ensure that it fully complies with the international standards. In addition to this, we also take into consideration the customization requests of our clients to meet their specific requirement. This machine is design to cut paper as well as 2 ply corrugated board (without damaging the flutes) in the form of sheets. The machine is used as an independent machine for cutting paper or 2-Ply board and can be synchronized with Paper Corrugation Machine for Online cutting of Sheets. This is a hand operated machine to cut the paper or corrugated board. The paper of corrugated roll is mounted on the reel stand and cut into sheets by unwinding. It can also be placed, next to corrugating machine for direct cutting the board into sheets. 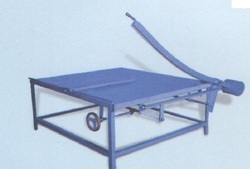 It is heavy duty in casted frame & the back platform can be provided in the required length. Foot operated pressure clamp can be provided in the machine, front & back guides are provided along with the cutting blades. Paper Reel to Sheet Cutting Machine is designed for high production & straight cutting ofsheets or two ply corrugated board with out damaging flutes and lines paper. This strongly design machine can be used as an independent unit or can be synchronized to a fr corrugation machine for direct and accurate sheet cutting. It minimizes the percentage of wastage. PIV Gear box is provided for adjusting of sheet to the required lengthom 20" to 80". Packaging Details: good quality Polly or Wooden packing(Exports Standards) as per customer demands.